A new innovative development in home cleaning makes its way to your household. While vacuum cleaners have undeniably come in handy, this system streamlines the whole process of moving and carrying the machine around while tidying up. What is it? None other than centralized vacuum systems! Instead of waving the nozzle around or using a dustpan, you can now clean up anything by moving it to the installed vent. Homeowners from the UK, US, and Australia have already installed this on their homes, especially those who have ongoing remodeling projects. Aside from that, pipelines are pre-installed in some places that are still under construction as a sort of method of preparation. Residents will then only have to add the power unit on the system to start using. Installation in existing houses, however, will have to start from scratch (piping, wiring, and setting up) but is, nevertheless, possible. As for ideal places for storage for this kind of vacuum cleaner are your garage, attic, or a crawlspace. You can also mount it on walls using braces or brackets. Having this inside your place minimizes the time needed to clean up, plus you will enjoy the comfort of lesser noise from the motor of your cleaner. One problem though is that there are different kinds of systems and units out in the market. To help you with that, here is a detailed guide to help you figure out which central vacuum system is the perfect match for your needs. The various centralized vacuum systems out there can be classified depending on the suction power, unit size, capacity, pipe diameter, and other relative features. If you are living in a bigger space, one that has larger square foot coverage is rather ideal; whereas in smaller homes, the thin-lined tubing units are more beneficial. Also, there are those that have stronger suction with less speed while some have built-in features that improve filters and noise-reduction. Did you know that even the dirt bag used inside can be of different types too? Some units don’t even need a bag. Additionally, the sizes of the motor depend on the capability of the cleaner’s filter bag too. Some can last up to two years until they need changing while others are only good for about half a year. Prices also differ based on the features of your chosen model. Some will come with their own accessories while others don’t. Aside from that, there are also kits and unit-only products that are sold. Know which purchase is more practical and can save you money. Think through what type you need and what will fit into your budget without compromising the benefits that you will enjoy. You have so many choices out there with not so many clues on what’s better and what’s best. 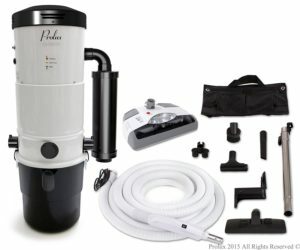 So, here is a brief yet informative rundown of must-know details of the top centralized vacuum systems available to you today. Metal plates at the bottom have rubber grommets attachment, which suppresses the vibrations. It uses a 50-foot flexible hose that you can use in a 360-degree rotation. The size is 13 inches long, 13 inches wide and 24 inches tall. It can hold about 7 gallons in its dirt bag and is tightly sealed with the top cap. This wall mounted vacuum is your typical centralized cleaner but uses a five-foot motor, which can sustain rust and corrosion with its powder-coated galvanized steel casing. 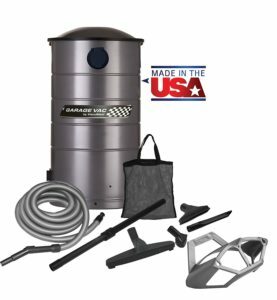 Its hose is perfect for cleaning up your garage, workshops, and even outdoor spaces. You don’t need to do any plumbing work when installing but will however, need the bracket to support its weight on the wall. It also has an estimated motor life of about 550-650 hours. During this time, this will operate with low vibrating sounds all thanks to its rubber grommets at the bottom. Unlike ordinary machines, this has a larger dirt capacity. However, it is only limited to absorb dry materials ─ no any kind of liquid. It is less noisy than most with the suppressors attached on. The lengthy hose is an advantage for when cleaning wide spaces or when cleaning from a distance. It is compact in size thus making it less space consuming. This is ideal for houses of small size or areas with no large storage available. This is not meant for moist and wet forms of dirt or any liquid to be exact. Despite the perks of the 50-foot hose, it also can be a disadvantage when storing since the size of the unit is way smaller for the length. While an ordinary compact vacuum cleaner has smaller capacity, this wall-mounted product gives you up to 7,000 gallon at a reasonable price. There is no need for frequent emptying out of the dirt bags. Save both your cash and effort for this one-time investment. The kit includes a 30 foot electric hose with a two-way speed switch among other parts. Its muffler silences the noise emitted on the exhaust and the overall sound of the motor. There are 3 types of Micron and HEPA filter and does not need a dirt bag. Using a power motor of Armtek stage 2, this is expected to last for quite a number of years. It can cover up to 12,000 square foot and is considered to be one of the most powerful systems in America. Protect your home from unwanted dirt and minute particles with this muffled unit to absorb everything. This is best to use for huge spaces because of its powerful motor and the area it can cover. When used in smaller places, the suction power it emits is rather stronger than in bigger ones. The three levels of filter is a money-saver because it saves you from all the dirt bags you need in typical units. The vacuum speed of particles becomes slower with the reduced airflow on its pipelines. If you are looking for a unit with wider area coverage, then this is more suitable for you. 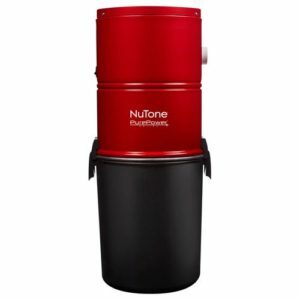 It makes a great save on the budget in the long run with its no-bag feature plus its three-level filtration system. Have a home safe from allergens that can harm your health. A DIY installation kit with 3 inlets for new or optimized centralized systems. It comes with a pipe that has a length of 80 feet. adaptor, inlet valve, tee, coupler, and even the solvent sealer. If you want to remedy your old system and add more vents in your home, then this is preferable to use. This is also ideal for new installations and will even suffice for two-story homes. It comes with a manual to guide you on how to put the parts together. This is a complete set to help you accomplish your do-your-own project. 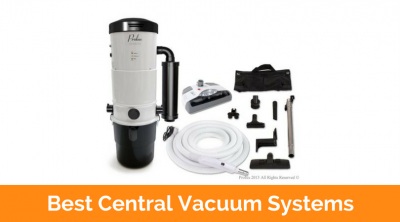 A kit that is suitable for self-help and does your own centralized vacuum system projects at home. This is easy to install with 45 and 90 degree-angled elbows to match the corners and turns of any structure. It has a larger capacity which results to lesser frequency in changing the dirt bag inside the unit. For more than average-sized areas, the elbows and other fittings might run short because they are only limited to certain number of pieces. Everything you need for an easy installation of your centralized system is in here. 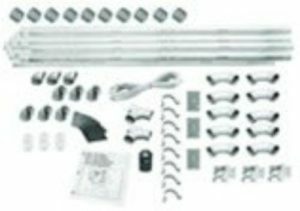 From fittings to pipes, this is your complete kit that is ready for assembly. If you need more fittings to go with this, you can find additional ones on stores since it uses the standard two inches size. This power unit is designed for the vacuum system of the same brand to bring a stronger suction performance. It can cover up to 3,000 square foot with over four gallons that fits right in its 11-inched diameter and 33-inched height. Its durability cannot be taken for granted as well with its steel body that is kept hard-cased to ensure that it withstands anything. The best feature this showcases is the self-cleaning HEPA filter that lessens your effort in manually doing it. It also doesn’t need vents and comes with noise-reduction technology to silence vibrations made by its motor. Take all the dust and allergens from your house with this high-performing corded vacuum unit. This unit’s case is made of steel that makes it sturdy and durable for heavy use. The built-in suppressant minimizes the sound emitted from the machine. It has a powerful 110 inches of suction power to make sure it absorbs all the particles being thrown on the vent. Unfortunately this is limited to only up to 3,000 square foot cleaning space. Some users had encountered problems of burned out motors and release valves popping. The Electrolux 4B-H403 Honeywell Central Vacuum System Power Unit is a self-cleaning vacuum unit with a heavy-duty case that protects it as you use it through the years. If you are looking for a corded unit to match your centralized system, then this is a suitable product to pair it with. Brags a HEPA self-cleaning filter system that does not need a dirt bag. It supports paper bag on its bin but works fine without it. The motor is tangential by-pass with high-performance expectation. 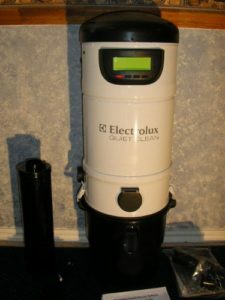 The Electrolux PU3650 is an average-sized cleaner that uses two-stage by-pass motor. Even if it only weighs 27.4 pounds, its power can still withstand an area of 8,000 square foot. The weight already includes its muffler, which keeps the noise down when cleaning. In fact, this takes pride in its quite cleaning advantage. Moreover, this doesn’t need a dirt bag inside its filter. It has its own self-cleaning feature. Although, it still allows paper bag to be used inside for when you wish to use one and can be emptied out manually. It has a conversion inside that keeps the bag in place at the bottom. Furthermore, this can also be mounted on the wall or on elevated spaces. This is a great catch for an acceptable price. The power of this unit is functional in areas of up to 8,000 square feet. The body can be opened from side to side for easier carpet cleaning. Although it has a strong motor power, the noise is still minimal for quiet cleaning. The motor easily gets affected with room temperature but is believed that putting the body in colder temperature can prevent overheating. Cut your budget for vacuum bags with this self-cleaning vacuum unit. It has two options whether to add a bag inside or not, and will suction dirt from up to 8,000 square foot of space. If you need a new or replacement unit for your system, this tangential-motored vacuum will not break your budget without compromising the quality. The capacity of dirt it can hold can last up to 6 gallons worth for about 6 months or so. Its 500 air watts power supports suction even in areas of 4,000 square feet. This system has its own self-suppression system that prevents excess noise from the running motor. The material used in this product can be made from either metal or plastic material. A performance worth the price ─ this centralized vacuum cleaner has a motor that will last until the 4,000-foot range. Despite having to be emptied out once or twice a year, this can still keep up to 6,000 gallons of dirt and dust. All these features are put together in a compact-sized casing that can be made of plastic or steel. Conveniently, this comes with its own power cord of approximately six-foot long. If the noise of this powerful unit is what you are worried about, then you might find relief when you find out that this has its own suppression system. It muffles the sound from the motor without installing an external muffler. Vacuum the entire house without disturbing anyone or the silence around. Another benefit it offers is the pail handle for the collected dirt which makes it easier to open and empty out the contents. Sadly though, this needs to be cleaned up every six months and then to make sure there is still enough space for more garbage to be collected. The power unit does not require too much space with its compact size and is perfect for smaller homes or storage. The motor functions silently even without a muffler due to the suppression system that lowers the sound made of the motor. It comes with a power cord that has a length of six foot; saves you from another expense. It has to be emptied out at least twice a year in average to give way for more debris to be collected. This is a lightweight and compact vacuum unit that is ideal for smaller places. Even with its size, its capacity is not limited. In fact, its power reaches until four thousand feet and six gallon of debris. If you want a vacuum for narrow areas, this one is appropriate for you. This unit has a durable case with an anti-corrosive epoxy coating for its protection against rust and other elements that affects steel. The suction power produced by the motor is still functional in spaces of about 7,500 square feet in size. It has an option to use either disposable paper bags, HEPA filters, or the collection pail inside the vacuum unit. The motor used is a 520-watts Ametek Lamb 2-stage tangential discharge blower with a fan system to keep it in normal temperature while running. This uses a 6-foot supply cord with an operating voltage of 120 volts. The suction power is 125 inch water lift and airflow of 121 cubic feet meter. This ultra clean vacuum cleaner that is made in Canada has a sturdy steel case that is protected with an anti-corrosive epoxy coating. Inside it is a 2-stage Ametek Lamb which has the power to cleanup an area of about 7,500 square feet. Conveniently, you have the option to release the exhaust to the outside. Furthermore, there is a variety of collection method for gathered garbage. You can use a disposable paper, a filter bag, or the metal pail type. The supply cord this unit uses has a prolonged plug with operating voltage of American standard. Save yourself from the trouble of hard wiring when setting up. Speaking of which, this can be placed on the floor or fixed on the wall. A mounting bracket comes with the set when you buy it. The downside in this, however, is its noise-reduction. When compared to others, this can be quite louder but can easily be solved with the optional muffler to add on it. It can provide a stronger suction in both wide and narrow areas. 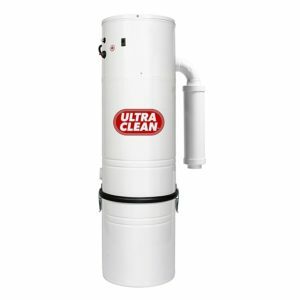 The unit is durable in either moist or dry storage to relieve you or worries when it comes to humid temperature and liquid waste. No hard wiring required because of the three prolonged plug of the power cord that comes with the set. This is a bit noisier than most but can be remedied with the optional external muffler you can add on it. This Canadian-made power unit will not let you down with its 7,500 square feet capacity. The performance it brings to your home is worth the price and will give you options of the debris holder to be used. Whether in moist or dry area, this will function as it is. It is durable and will meet your vacuum unit needs. While there are different Pros and cons for every product, keep in mind this list above to make your decision making smoother. Will you go for the larger collection capacity or would you rather have the strongest power suction? The household dust and garbage won’t clean up after themselves but you have the centralized vacuum system to assist you in keeping everything neat and free from trash. Consider these things above and make your purchase worth every drop of the penny.